On Wednesday, the United Federation of Planets ("Fed") did something it has only done once in the past 10 years: It voted to have hors d'oeuvres (pronounced "horse's doovers") served at the next meeting. It also raised interest rates in our sector of the galaxy by one-quarter portion (okay, now I'm mixing sci-fi franchises, which is a major no-no!). Anyway, this means that the previously-booming dilithium crystal refinancing market will slow considerably, since nobody wants to refinance their dilithium at a higher rate -- if you could imagine! Everyone is now expecting three (3) quarter-point rate increases in 2017, which seems a bit silly, inasmuch as I thought we were expecting something along those lines for 2016, but it never happened because the Fed chickened out repeatedly. According to Janet Yellen, this was due to "reasons," which included (in order): "The chance of evening thundershowers; that one hurricane that almost hit somewhere; the Cubs winning the World Series." As timid as this Fed has shown itself to be, all it will take is one marginal job report to put the brakes on this "three rate increase" schedule. The market reacted as though it was surprised by the current rate increase, which is also silly, and the rally went whatever direction is the opposite of "up" (there's a word for this other direction, but I can't remember it. Starts with a "D" I think. Darn? Dane? It'll come to me.). 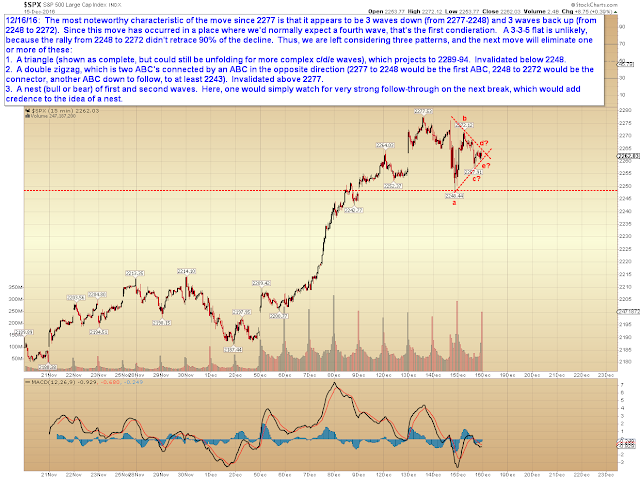 I should also note that there are a couple less-common patterns that could fit the present wave structure, but for ease of reader consumption, I'm keeping those to myself and merely watching to see if the market makes the "next step" in those patterns, upon which I would then discuss them publicly. 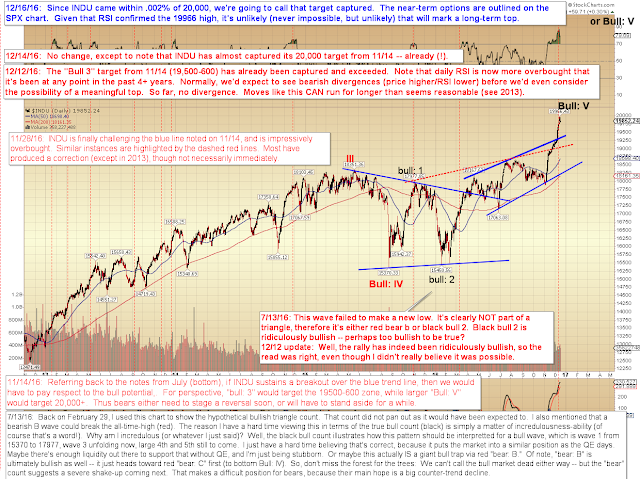 Taking a look at INDU's chart: For all practical purposes, INDU captured its 20,000 target. This means that, heck, sure, the rally could be over, why not? But that seems unlikely, given the supporting evidence. 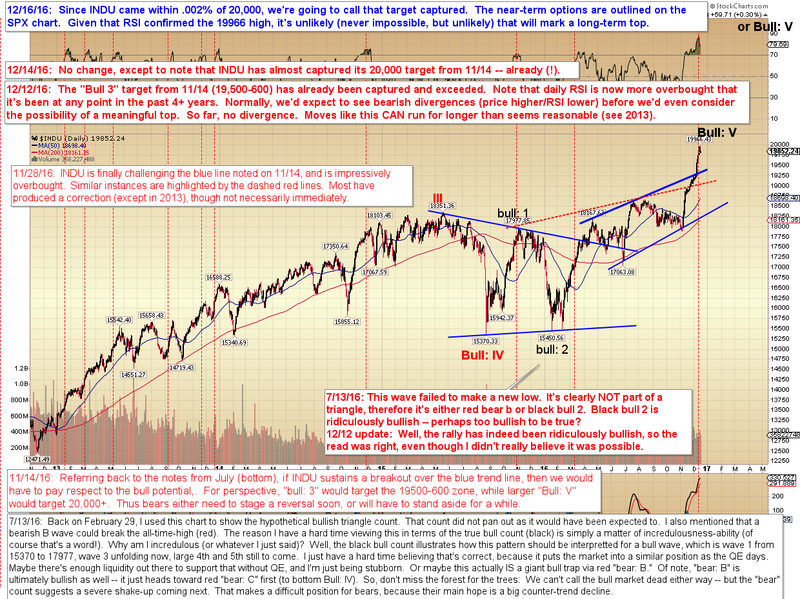 In conclusion, the near-term pattern indicates that the market has kept its options open, but presently, it's unlikely we've arrived at any sort of long-term top. 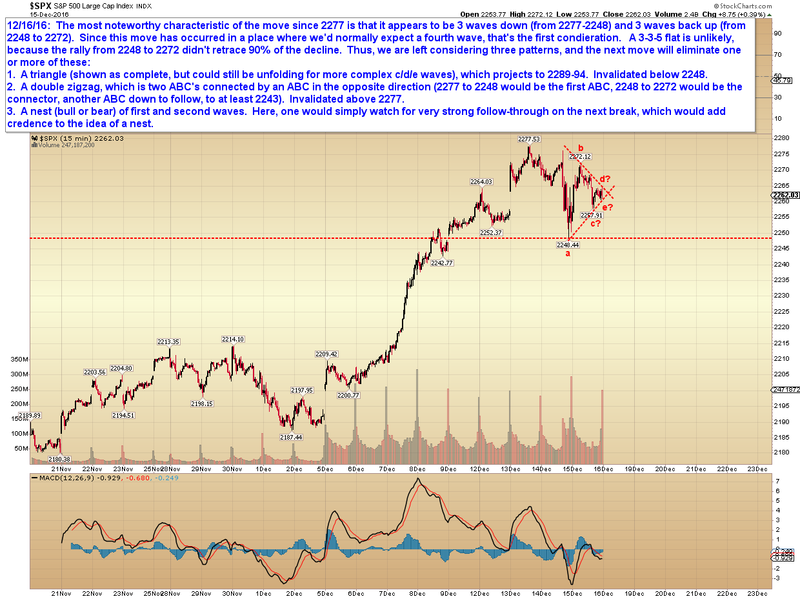 However, in the event bears were to kick out 2240 with authority, then we'd at least have to consider the possibility of a larger correction unfolding in the interim, which would cause the market to head... um... "down"! That's the word I was looking for earlier. Trade safe.